I did not learn how to make microwave chicken recipes until I was older. They did not exist when I was very young. I do not cook a lot in microwave except for leftovers, but when I am in a hurry to cook a meal, poultry is well suited to this cooking technique. Microwaving involves many of the same techniques as does conventional cooking so it is easy to learn. First I must say that you should thoroughly read your instruction manual. Different microwaves will vary to some extent so it is important to read what the manufacturer has written about your oven. When I learned how to cook microwave chicken recipes, I found there are some results which cannot be done in the microwave oven. If you want a crisp crust on the chicken, this will need to be cooked on the stove to obtain these results. Deep fried foods cannot be done in the microwave; fat can splatter and the temperature cannot be kept at a constant. When you learn how to cook microwave chicken recipes there are some things to keep in mind when preparing because the cooking time is accelerated. The microwave energy usually enters from the top which results in faster cooking on the top. For this reason the chicken will need to be turned over for more even cooking. Small pieces of the chicken will cook faster that a whole chicken. It is important to cut the chicken pieces in more even size for them to cook more evenly; for instance the chicken breast can be cut into four pieces to balance with the other pieces. During the cooking, rearrange the pieces occasionally to ensure more even cooking. The cooking of microwave chicken recipes will vary according to the temperature of the chicken before placing in the oven. That which has been taken directly from the refrigerator will take longer than that which has set at room temperature for several minutes; the colder it is, the longer it takes to cook. Also, take note that food continues to cook after removing from the microwave therefore check the food at the minimum time given in a recipe. HOW TO COOK WHOLE CHICKEN IN MICROWAVE Microwave chicken recipes cook better if whole chickens are cut into evenly sized pieces. Cut chicken into pieces; separate thighs from legs and cut whole breast into 4 pieces. Place chicken pieces and onion slices in 3 quart casserole dish; sprinkle the salt over the top. 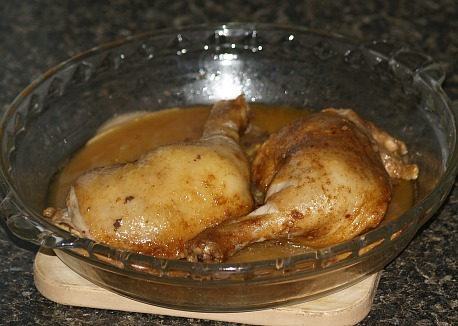 Pour water over the chicken; cover tightly and microwave on high (100%) for 15 minutes. Rearrange the chicken and cover tightly; microwave on medium (50%) 20 minutes longer. Rearrange the chicken; cover and microwave until thickest pieces are done about 20 to 30 minutes. Remove the chicken from the broth. Cover and refrigerate until cool enough to handle about 15 minutes. NOTE: This meat can be removed from the bones to use in other microwave chicken recipes. This chicken and biscuit recipe is great to make with leftovers after cooking microwave chicken recipe. Combine and mix all ingredients in 1 quart casserole. Cover tightly and microwave on high (100%) until hot and bubbly about 5 to 7 minutes. Stir and serve over biscuits. Combine flour, baking powder and salt; cut in shortening. Stir in enough milk until dough leaves sides of bowl into ball. Knead dough on lightly floured surface; roll to ½ inch thick and cut with biscuit cutter. Arrange 6 biscuits with side almost touching in circle on 10 inch plate lined with 2 paper towels. Brush tops with paprika topping. Microwave on high (100%) 1 minute. Rotate plate ½ turn and microwave until no longer doughy 1 to 2 minutes. Let stand 1 minute and remove to rack; repeat with remaining biscuits. Combine all ingredients in glass casserole dish and blend. Stir in chicken pieces to coat all sides; cover. Microwave on high for 40 to 45 minutes or until chicken is done; stir one time.